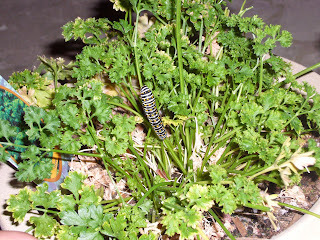 With all of the hulabaloo over the past few days - school ending, Alexander's birthday, etc., we forgot about the caterpillar eating the parsley plant. Until today. 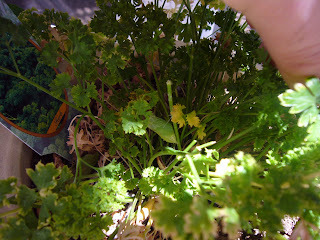 Look directly into the center of the plant, to the left of the two yellow leaves and the long skinny stem- and you will see a long green pod - that's the caterpillar. I can't believe we missed it! Sabrina is going to put a post-it note by the back door reminding us to check him each day - how long does it take a caterpillar to turn into a butterfly?